It’s officially summer! Time to break out the sun screen and take time off work to enjoy all the activities Michigan has to offer. Below we have listed some of our favorite locations in Michigan to enjoy the weather. 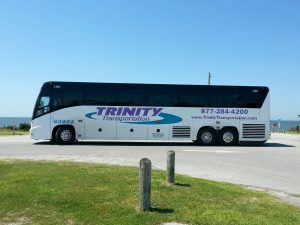 Don’t forget about Trinity’s vast fleet of vehicles that can solve any of your transportation needs this summer! Mackinac has a wide variety of things to do on the island. Biking is a popular past time with over 70 miles of natural and paved trails. Bicycles are available to rent in a wide array from single-speed, five-speed, ten-speed, tandems, etc… Visiting the Grand Hotel is something that I suggest everyone does on Mackinac Island. Built during the Victorian era, this enormous hotel is stunning and well groomed, hosting a variety of colorful plants and flowers. 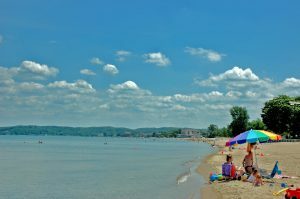 One of Michigan’s most beautiful beach towns is Traverse City. Play along miles of sugar-sand beaches, visit the magnificent Sleeping Bear Dunes, sail on a Tall Ship, watch a parade, go to a drive-in movie, or eat cherry pie from the Cherry Capital of the World. 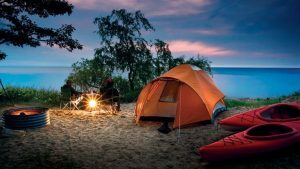 Michigan has a number of state and private campgrounds individuals can appreciate. Enjoy camping near sandy beaches, lighthouses and bays. 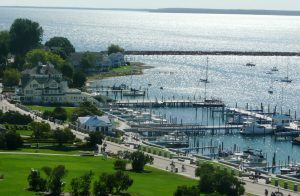 Hop a ferry to Mackinac Island, a charming auto-free vacation escape. Inland, lakes and rivers sparkle amid pine forests, where a tent, cabin or RV makes a great base for fishing, hiking and other outdoor pursuits. 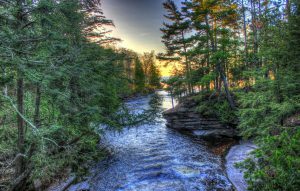 The Porcupine Mountains in Ontonagon, Michigan is a perfect getaway for the adventurous type. There are several activities you can participate in, including canoeing, kayaking, fishing, mountain biking and hiking.